Whole course is divided into TOPICS (CA Final 800+ Topics / CA IPCC 400+ Topics). Then each concept is marked A, B, C as per their importance. Further each concept with ABC categorisation is tagged in software, so that you can click on tag and see directly that concept. This is very helpful for strategizing studies. Depending on time available some may watch ABC for important topics and only A for remaining topics. Some may watch only A category topics. It will be a great help to revise. Volume management has become easy. Revision can be done in better manner. It is easy to just record whatever professor knows comfortably and prepare a hasty set of videos. But it needs lot of research, patience hard work to cover each and every concept from corners of ICAI material. We guarantee that our videos and notes cover more relevant content than anyone else. It is not an overview course, each point in each and every topic is explained. There is example on each and every point. We have devised memory technique and memory flow for each and every topic. Being theory subject, our focus has been on how to memories so many points. Very convenient and distraction free doubt solving on our website at Auditguru.in/discussion-points. You can ask doubts anytime you want. You can also search from large database of solved queries. Each and every doubt is solved to the extent of full satisfaction. You can also solve doubts on call on given timings. As on April 18 Around 22,000 YouTube Subscribers with 1.2 million views, 30,000 Facebook Likes and 15,000 WhatsApp Followers. More than 3000 Students study audit from us during the year and faith is increasing day by day. We are amongst few professors in audit who have these high quality studio recorded lectures. There is continuous eye contact. Students attention is gripped and study speed increases. We cover 1.5 times to 2 times more in an hour as compared to classroom recording. Because there are no time wastage first 10-15 minutes, last 10-15 minutes, time pas after every 45 minutes which is must in face to face classes. Further our notes are comprehensive including all charts, shortcuts and examples so we don’t have to write everything in class, saving loads of time. We have preserved our time, energy and team only for audit subject. So we eat sleep drink only audit. We specialise only in audit. Students can enroll for our lectures for next 2-3 attempts as we give validity of one year. And during this time all changes are given free of charge to all registered students. Further we have kept our views at 4 times. That means student can see lecture of one hour up to 4 hours. Number of clicks doesn’t matter. In exceptional circumstances if admin deems fit they can extend lectures with some extra cost. 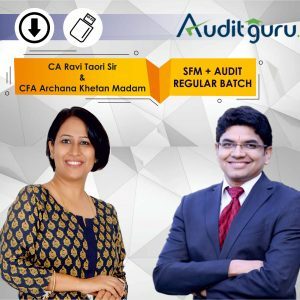 Ravi sir has post qualification experience of 11 years in teaching and he did his Articleship with PWC and Industrial Training with Standard Chartered Mutual Fund which gives him immense knowledge to teach audit subject. He has been rank holder in PE-II examination. And he has also tasted failure in one group in ca final. So he has both the experiences. He has taught face to face students from Delhi / Chandigarh / Jaipur / Kolkata / Kanpur / Ahmedabad / Raipur / Indore / Nagpur / Pune / Mumbai / Bangalore / Hyderabad / Dubai and his students through video lectures are present across India. So he knows how students from all region think act and study.